Here at Grey Ops, we try not to make a habit of reviewing individual Paintball fields. Of course if we review or report on a specific Paintball event, naturally we'll take a quick look at the field it's held at, and feature that in the review. Another exception is if the field itself is exceptional. In a world of pallet bunkers, trees, blue coveralls, and rental 98s, it's refreshing to see something designed to be different and fun. 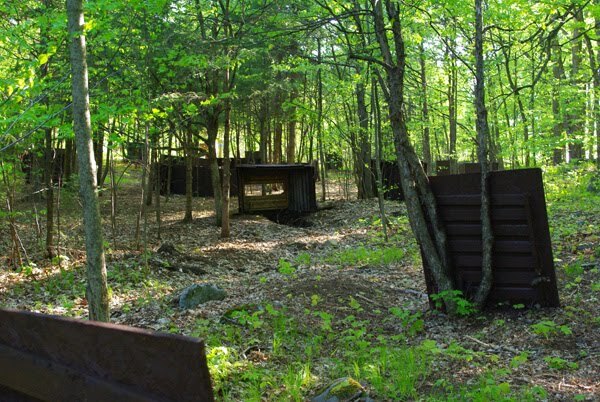 Like if someone converts a mothballed military base into a Paintball facility, or designs a Paintball park around a historic scenario with real dedication to detail, it deserves to be featured here. But generally we'd rather not give free publicity to fields, which would lead to bitching and moaning from others who don't get featured (or get bad reviews). There's enough drama in the Paintball world as it is. Another exception is when a field is active in supporting a good cause, or helps out in the community. As an example, we featured JT's Frontline Paintball last year when they hosted a charity event for cancer research. 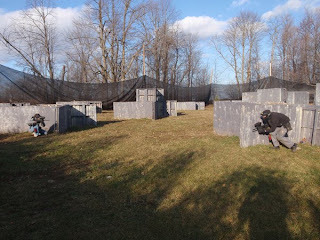 This time around, I'd like to review Marked Paintball, an Ottawa-area field that's very active in their community, and which we've only mentioned occasionally in passing on Grey Ops until now. Marked Paintball has been open since 2008, when owners Dag and Allie Militky decided to supplement their day jobs by opening up a facility dedicated to the game they both love. That facility has grown to feature 5 playing fields, designed around a philosophy of compact, fun battlezones. 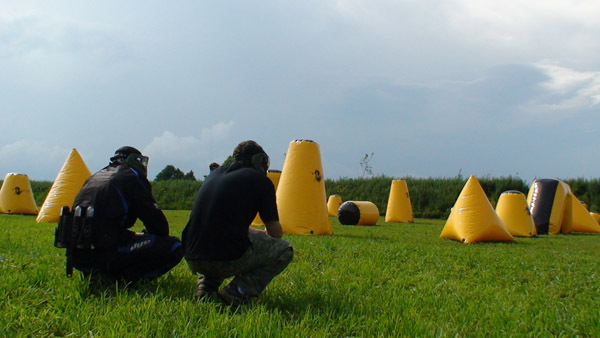 The facility's main focus is on recreational Paintballers, and typically those players don't like to sneak around the woods for 15 minutes before finding their boss or team coach (and then shooting him mercilessly). To this end, the fields are designed so that battles are instant, and you can go gunning directly for that co-worker or teammate who trash-talked on the bus on the way there. 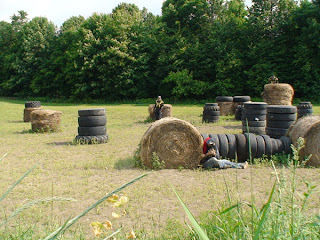 In this vein, Marked's most popular field is "Hillbilly Ball", a speedball-style field that replaces inflatable bunkers with hay bales and barrels (like Old School outlaw fields on farms - hence the name). The layout allows players to get right into the action, in fast-paced rounds that emphasize teamwork and outmaneuvering your opponents. "Ruins" follows a similar concept, but is composed of slate grey wooden bunkers in cross shapes (+), allowing players to take cover on different sides and foil flanking moves. "Spy vs. Spy" and "Onion Rock Valley" are wooded fields with obstacles like rocks, bunkers, and ditches, making for slow moving, strategic games that force you to use suppressing fire, moving slowly, and staying low to gain the advantage and win. Marked Paintball is also a big supporter of the Speedball community in the Ottawa area, with a CXBL regulation-sized X-Ball field, and 3 league teams of different levels calling it home. Marked Paintball's rental equipment consists of Tippmann A5 markers, Proto Switch EL goggles, and Ninja 48ci 3000psi HPA tanks. (In fact, Marked doesn't offer CO2 as an air option at all, going exclusively instead with the more economical, marker-friendly, and environmentally-friendly HPA). Their rental package is competitively-priced, with the entire kit going for $20. 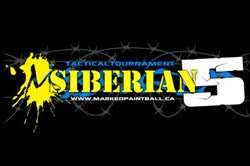 Marked Paintball is a field paint-only operation, and paintballs are sold at an extremely reasonable price (relative to the Ottawa-area market). Tournament-grade Draxxus paintballs run renters $30 per bag of 500, while members pay $20 per bag. This is nice to see in an industry where most fields charge reasonable prices to members for paint, but charge often twice as much or more to renters for the same stuff. In addition to this, the Militkys don't gouge players by forcing them to buy more paintballs to get a discount; instead, with Marked's business model the low $30/$20 per bag price applies no matter how much you buy, meaning you don't need to buy more than you actually need to get a decent price on paint. On the subject of paintballs, this is where Marked really shines. The paint is stored in a climate-controlled trailer at all times, which keeps it fresh all season. Unlike some other fields that buy as many skids of paint as they can in the spring (to get a volume discount), then let it sit baking in a shed all summer while the gelatin shells get hard, Marked's paint breaks easy on your opponents, hurts a lot less, and won't have you coming home covered in welts. This also makes it a great place for kids and first-time adult players to play, so that they'll leave the field having gone through a positive Paintball experience. Speaking of positive, Marked Paintball is very involved in community and charity efforts. Walk-on players with their own equipment have a choice of either bringing 2 cans of perishable goods as their walk-on fee (to be donated to a food bank during the holiday season), or of paying a $5 cash walk-on fee. At the end of the season, members of the Marked Paintball Forum can vote on to what charity/charities the money collected all year gets donated. Marked's 2010 donation numbers are posted here, and that should give you an idea of how they give back. Of course the numbers for their 2011 donations haven't been posted yet, but Marked did donate a large sum of money to Patricia's fundraising as part of the Grey Ops 10k Challenge in May. Marked has traditionally been a "rec-ball" facility, but the Militkys welcome anyone from the Milsim community that wants to come out and play at the field. It's not unusual to see camo uniforms and Milsim markers at Marked, as the Woodsball fields there are great for the Milsim community as well. In fact, every fall Marked holds the Siberian 5 Tactical Tournament, a 5 vs. 5 tournament where players assume different "classes" (engineer, assault, etc). And as the facility is located close to the Canadian Forces station at Dwyer Hill, military men and women often come out to enjoy a few rounds of Paintball. The Militkys have a LOT of undeveloped land on their property, and big plans for it. Up until recently the field's expansion has been put on hold for administrative reasons, but when the dust settles construction of a huge Milsim field for Big Games will begin. Right now Marked is renewing their rental equipment fleet, and selling off their used equipment for a great price! 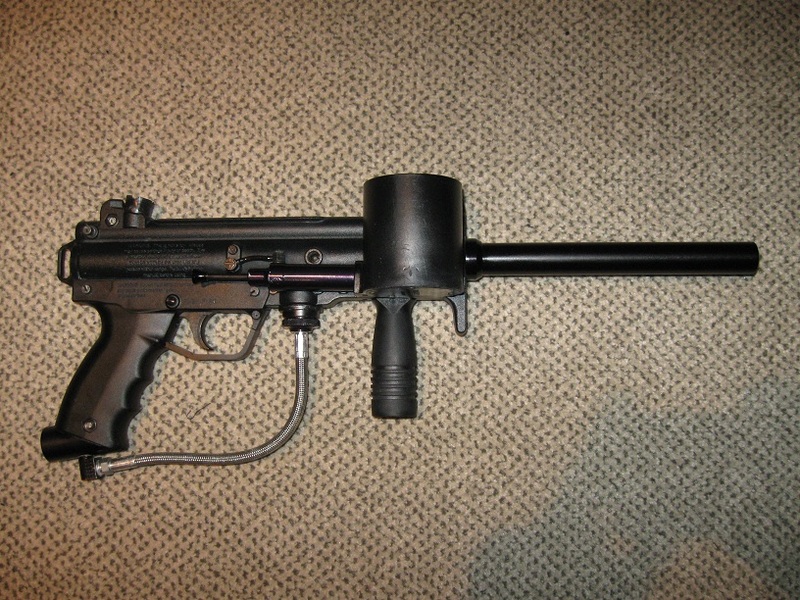 For $200 you get a Tippmann A5 marker with Cyclone Feed and hopper, a 48ci 3000psi Ninja High Pressure Air tank, and a membership to Marked Paintball for 2011. I picked up the A5 and HPA tank for a buddy (but kept the $200-value membership for myself! ), and found the gun to be in excellent shape, and extremely well-maintained. As a bonus, when you buy this package, you get a 1-year warranty on both the A5 and the HPA tank (through Marked Paintball). Contact info@markedpaintball.ca for more info! I've played at Marked Paintball since 2009, and whole-heartedly recommend it. Whether you're new to Paintball or experienced, a rec-baller, Speedballer, or active on the Milsim side of the game, I'm confident you'll have a great time. If you live within driving distance of Ottawa, be sure to check it out!